The last two Heisman winners, Marcus Mariota and Jameis Winston squared off in the first college football semi-final game. Mariota led his team to a 59-20 rout of the Seminoles. The very first national semi-final playoff game was played between the Oregon Ducks and the Florida State Seminoles in the Rose Bowl. Oregon came into the game with a 12-1 record and had won eight in a row. Florida State was the reigning National Champion and had won 29 games in a row. The game also featured Oregon QB Marcus Mariota and Florida State QB Jameis Winston, the last two Heisman Trophy winners. Florida State grabbed the early momentum by holding the Ducks and forcing a punt, then going on a 10 play drive that was capped off by a 48 yard field goal to take an early 3-0 lead. The lead was short lived though as Oregon took the kickoff and quickly moved 73 yards in 9 plays and only using 2:11 off the clock. They took the lead on a 1 yard run by freshman running back Royce Freeman. On the extra point, backup QB Taylor Alie connected with linebacker Christian French for the 2-point conversion and Oregon had an 8-3 lead. The Ducks had a chance to really blow it open early after a short Seminole punt gave them the ball at the Florida State 40 yard line. The Seminole defense, however, stood tall and forced a turnover on downs by stopping the Ducks on 4th and 5 at the Florida State 22 yard line. On the first play of the 2nd quarter, Florida State almost took the lead, but Winston was stopped at the Duck’s 1 yard line on 4th down. After the stop, Mariota drove his team methodically downfield on an 88 yard drive taking 19 plays. The Ducks had to settle for a field goal, but had a 11-3 lead. Florida State fought right back, but their drive stalled inside the Oregon 10 yard line and had to settle for a field goal to cut the lead to 11-6. The pace of the game began to pick up as Oregon scored again, needing only 3:00 to go 75 yards. Sophomore running back Thomas Tyner took it over from a yard out to increase the Ducks lead to 18-6. The Seminoles fought right back using the legs and receiving skills of running back Karlos Williams. The senior ran it in from 10 yards out to cut the lead to 18-13. Neither team scored on their last possession of the half, so the Ducks took a five point lead into the locker room. The Seminoles had to feel good that they were within one score of the Ducks at the half, but that feeling went away quickly. On their first possession of the 3rd quarter, Florida State running back Dalvin Cook fumbled and Oregon linebacker Derrick Malone recovered at the Florida State 31 yard line. Five plays later, Freeman scored again to increase the Ducks lead to 25-13. Jameis Winston has been known for his poise and ability to rally his team and it looked like he might do that on their next possession. Winston connected with freshman receiver Travis Rudolph to cut the lead to 25-20. Mariota answered the score with a quick score of his own, this time on a 56 yard pass to freshman receiver Darren Carrington. On the Seminoles next possession, Cook fumbled again and safety Reggie Daniels recovered at the Florida State 43 yard line. Two plays later, Mariota hit Carrington again, this time on a 30 yard score and all of a sudden Oregon had a 39-20 lead. The wheels really came off on the next series for Florida State. Winston drove his team to the Oregon 30 yard line, but on 4th and 5, he uncharacteristically panicked. After dropping back to pass and not finding anyone open, he began to scramble and then the ball slipped out of his hand. Oregon linebacker Tony Washington scooped up the ball and ran 58 yards to give his team a 45-20 lead. Amazingly, Florida State seemed to give up in the 4th quarter. The Ducks easily scored on a 23 yard run by Mariota and a 21 yard run by Tyner. What had been a fairly tight game for 2 ½ quarters ended up being a 59-20 rout. I really thought that out of the two semi-final games, that Florida State might have had the best chance at an upset. Boy was I wrong! The speed of the Oregon offense just puts too much pressure on opposing offenses to keep up. Sooner or later it seems that most teams start to press and make mistakes and the next thing you know the game is out of hand. Jameis Winston may take the heat for this loss, but the Ducks held Rashad Greene and Nick O’Leary to 7 catches for 63 yards…COMBINED! Then you add in the two fumbles by Dalvin Cook and this could have been a much different game. You have to give the Ducks defense credit for keeping the Seminoles out of the end zone and forcing turnovers which put the game out of reach. The Oregon win will give them their second appearance in the title game since 2010. Auburn defeated them in 2010 to take the championship. This year the Ducks should be the favorite to win it all. It looks like the only thing that can stop Oregon right now is Oregon. Marcus Mariota, QB, Jr (6-4, 219): 2014 Heisman Trophy winner. If he declares for the 2015 draft, he could be a top 5 pick and possibly go #1 overall. Good height, but is a little bit skinny. Extremely athletic. Exceptional speed. Very accurate and takes care of the ball. Tough to defend because of his speed and his ability to improvise. Thrives in the up tempo offense and has a great command of the offense. Reads the defense and distributes the ball quickly. Has the ability to make all the throws. Completed 26 of 36 for 338 yards with 2 TD and 1 INT. Had 62 yards rushing on 8 carries and had a 23 yard TD run. Byron Marshall, RB, Jr (5-10, 205): Versatile player that can carry the ball, catch the ball and return kicks. Former wide receiver. Is a bigger part of the passing game than in the rushing attack. Only had 1 carry for 0 yards, but caught 5 passes for 20 yards. Would be a good 3rd down back that could split outside and create mismatches at the next level. Evan Baylis, TE, RS Soph (6-6, 250): Great size. Soft hands. Has the ability to slip tackles after the catch. Tough to bring down. Had a career game with 6 catches for 73 yards. Jake Fisher, LT, Sr (6-6, 300): Has the size you want as your blind side pass protector. Good length and long arms. Key to the offensive line. Missed the Arizona game which was their only loss of the year and Mariota took a beating in that game. DeForest Buckner, DE, Jr (6-7, 290): Great size. Considered to be the Ducks best defensive lineman. Knows how to get into passing lanes and bat down balls. Has the size to be a good 3-4 defensive end. Had 4 tackles, 1 tackle for loss and 1 batted pass. Arik Armstead, DT/DE, Jr (6-8, 290): Massive size. Has played inside and outside. Would be ideal as a 4-3 defensive tackle or as a 3-4 defensive end. Knows how to pressure the QB. Gets good inside push when rushing the passer. Good instincts. Had 4 tackles and 1 QB hurry. Tony Washington, OLB, Sr (6-3, 250): Good pass rusher. Sure tackler. Experienced playmaker. Had 4 tackles, 1 tackle for loss, 1 sack and had a 58 yard strip, scoop and score. Christian French, OLB, Jr (6-5, 245): Former tight end. Had 2 tackles and caught a pass for a 2-point conversion. Derrick Malone, ILB, Sr (6-2, 220): Makes plays all over the field. Had 5 tackles and a great strip/recovery. Troy Hill, CB, Sr (5-11, 175): Plays tight man coverage. Knows how to use correct technique to get his hand in and knock the ball away from the receiver. Does a good job in run support. Led the team with 9 tackles, 1 tackle for loss and 2 pass breakups. Reggie Daniels, SS, RS Soph (6-1, 205): Plays well in the box. Brings the wood. Has the ability to cover tight ends. Tied with Hill with 9 tackles, 1 fumble recovery, 1 pass break up and had a big 3rd down stop in the red zone. Erick Dargan, FS, Sr (5-11, 210): Very versatile. Led the team with 90 tackles for the year. Led the Pac-12 and tied for #3 in the country with 7 interceptions. Smart and instinctive. Does a good job reading his keys and reacting. Great concentration. Had 8 tackles, 1 forced fumble, 1 pass breakup and an interception off of a tipped ball. 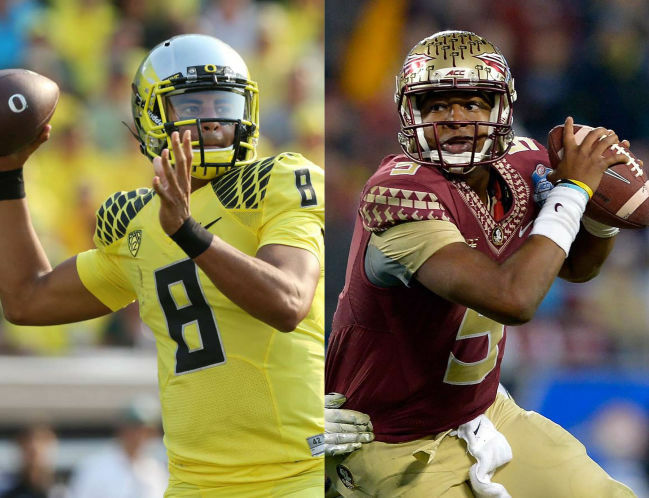 Jameis Winston, QB, RS Soph (6-4, 230): 2013 Heisman Trophy winner. Has a big frame and a strong arm. Able to make all the throws. Patient player that normally doesn’t get rattled. Has an amazing ability to shut out distractions and focus on football. Uses his eyes to look off defenders. Throws well on the run. Isn’t a big threat to run, but has the ability to get a first down with his legs when he needs it. Has the strength to stiff arm defenders. Has a very good ability to rally his team when needed. Able to put the team on his shoulders and guide them to a win. Likely a 1st round pick in the 2015 draft. Completed 29 of 45 passes for 348 yards with 1 TD and 1 INT and 1 fumble that was returned for a TD. Karlos Williams, RB, Sr (6-1, 225): Former safety. Great size. Has an upright running style. Good straight line speed and is better as a north – south runner. Doesn’t have great moves, but does a good job making one cut and hitting the hole. Runs with good power and determination. Takes choppy steps to keep himself under control. Good outlet receiver. Good blocker. Had 12 carries for 80 yards and 1 TD. Had 5 catches for 59 yards and had a 24 yard reception. Rashad Greene, WR, Sr (6-1, 180): Was 9th in the country with 99 catches and 8th in the country with 1,365 receiving yards. Had a great chemistry with Winston and became the go to receiver. Has the school record for career receptions and yardage. Does a good job reading coverage and finding soft spots. Makes people miss after the catch. Has the ability to return punts. Had a quiet night with just 6 catches for 59 yards and had 1 drop. Nick O’Leary, TE, Jr (6-3, 247): Was playing with a hamstring injury and had a quiet night. Versatile player that is a good blocker and a good receiver. Good pass protector. Has good hands and the ability to beat a defense down the seam when healthy. Was held to only 1 catch for 4 yards. Cameron Erving, OL, Sr (6-6, 308): FSU’s most experienced player with 43 starts. Was the starter at left tackle, but moved to center the last 5 games. The move to center solidified the offensive line and jump started a stagnant running game. Might actually be a better interior player than at tackle at the next level. Was called for a false start. Mario Edwards Jr, DE, Jr (6-3, 294): Son for former Cowboys corner Mario Edwards. Good size. May move inside at the next level. Good athleticism. One of the leaders of the defense. Reggie Northrup, MLB, Jr (6-1, 220): Was #4 in the ACC with 122 tackles. An undersized middle linebacker with the speed to purse all over the field. Always around the ball. Had 9 tackles. P.J. Williams, CB, Jr (6-0, 196): Physical corner that likes to match up with the best receiver of the opponent. Good in run support. Wraps up the ball carrier. Led the team with 14 tackles and ½ tackle for loss. Ronald Darby, CB, Jr (5-11, 195): Big hitter. Knows how to use big hits to force incompletions. Had 6 tackles. Tyler Hunter, SS, Sr (5-11, 200): Does a good job in run support. Flies to the ball. Has the ability to fight off blockers and make the play. Had 5 tackles and ½ tackle for loss. I will return tomorrow when I will discuss Ohio State’s upset of Alabama. If you like what you read, like us on Facebook and tell your friends. This entry was posted on January 7, 2015 by draftmaniacs in Uncategorized and tagged 2015 NFL draft, Arik Armstead, Boston College Eagles, Byron Marshall, Cameron Erving, CFP25, Christian French, College football, Dalvin Cook, Darren Carrington, DeForest Buckner, Derrick Malone, Erick Dargan, Evan Baylis, Florida State Seminoles, Jake Fisher, Jameis Winston, Karlos Williams, Marcus Mariota, Mario Edwards Jr., NFL, NFL Draft, Nick O'Leary, Oregon Ducks, P.J. Williams, Rashad Greene, Reggie Daniels, Reggie Northrup, Rodney Hardrick, Ronald Darby, Royce Freeman, Taylor Alie, Thomas Tyner, Tony Washington, Travis Rudolph, Troy Hill, Tyler Hunter.